The holidays can be a time of more, more, more, with much of the excess ending up in the landfill. 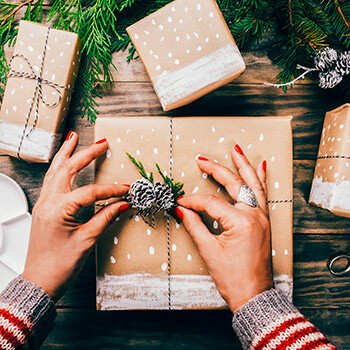 Cut the chaos and the waste with these five easy yet effective ways to make the holidays eco-festive. While holiday sales may tempt you to buy for everyone who’s not on your list, consider the impact that excess purchases will have on the environment. Extra packaging, gift wrap and potentially the gift itself can end up in the landfill. If you are going to give gifts, consider buying items that are locally produced or sustainably sourced. Check out the Robert Langen Art Gallery’s annual Holiday Art Market at the Laurier Library from Dec. 3-7 for local (and golden!) gift ideas. The Laurier Bookstore and the Stedman Community Bookstore also carry eco-friendly gift ideas likes stainless steel travel mugs and straws. Experience gifts reduce waste and offer the added bonus of spending time with the recipient. The gift of your time is also thoughtful, eco-friendly option. Spend time with an aging friend or family member or volunteer with an environmental group in your community. Visit the Volunteer Action Centre website for opportunities in Waterloo Region. For opportunities in Brantford, visit the Brant Regional Association of Volunteer Administrators website. Charitable donations can make a positive impact on people and the planet. Consider giving to a social or environmental charity or support one of the 2018 HAWKstarter campaigns. Pretty papers and all the trimmings look nice, but are they really necessary? This year, consider giving your gift as-is or re-using gift bags. If you’re crafty, you could try making reusable cloth gift bags from old clothes, pillowcases or bed sheets. Laurier’s Library offers drop-in maker sessions on Mondays; contact Darrin White to arrange a time to use the sewing machine. If you are going to use gift wrap, use papers that are made from 100 percent post-consumer recycled paper, are FSC-certified or are biodegradable. Use yarn or twine instead of plastic ribbon and bows that don’t break down. There are many ways to make your holiday entertaining eco-friendly. Plan your quantities accordingly, especially for large gatherings. If everyone is contributing a dish, there will likely be more than enough food to go around. If there are extras, send them home in reusable or compostable containers instead of plastic food bags. Compost any food that won’t be consumed by you or your guests. If you entertain with disposable serving ware, consider using biodegradable plates, napkins or cutlery made from bamboo and other renewable sources. With winter temperatures upon us, it can be tempting to crank up the thermostat. Instead, put on a sweater or add an extra blanket to your bed. Turn off any lights that don’t need to be on (including outdoor holidays lights before bed). Use LED bulbs for holiday décor. It costs less than one dollar to power a holiday tree with LED lights for 12 hours per day for 40 days. Greeting cards are nice to receive but once the holidays are over, the cards are either thrown out or end up in a recycling bin. Last year, Canadians purchased more than 2.6 million greeting cards; that adds to a big pile of potentially unrecyclable paper. This year, consider sharing your holiday message with a phone call, text, email or video message. If you are going to send paper cards, look for ones that are made from recycled materials or are biodegradable.